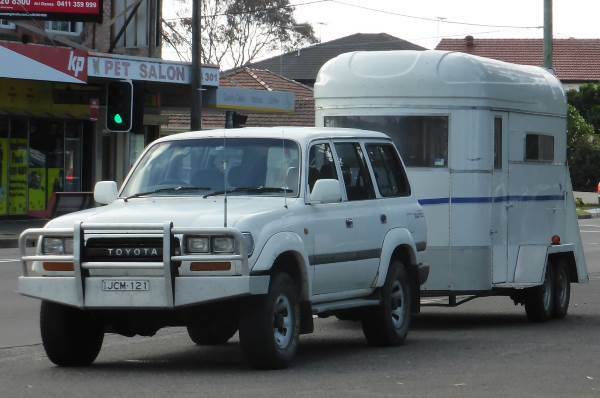 Are you permitted to drive a car towing more than one trailer? Are you permitted to drive a car towing more than one trailer? Correct. Cars are not designed to cope with pulling multiple trailers, and loss of control could occur. Towing requires its own special set of skills. While it's fairly easy to tow a small trailer when driving forwards, towing a large trailer is much harder as can lengthen braking distances considerably, can make it more difficult on tight corners, and when travelling in hilly regions puts a lot of strain on the vehicle's components (particularly the drivetrain and chassis). If the load is top heavy, like a large boat, or can move, like a horse, then driving is more difficult yet again. Then there's the issue of reversing with a trailer which is tricky in itself not only in manoeuvring, but also because it presents more of a danger unless you have a spotter or guide. Towing more than one trailer requires additional skill, therefore you are not allowed to tow two trailers at the same time with a car. To find out more about towing, read our guide to towing. There are cases when an empty trailer will causes a car to take longer to stop than a full trailer. Although the physics and mechanics of this generally applies to heavy trucks, suspension and brakes on large trailers are designed to work most effectively when they are loaded. When a trailer is empty, it carries very little weight, can bounce around more and provides must less stopping power but while still pushing the vehicle forwards.